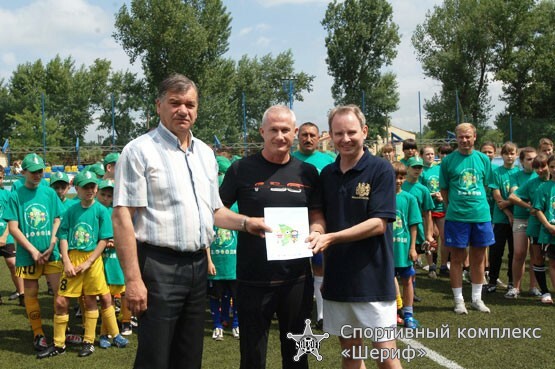 From June, 7th during five days the football festival with sonorous and very symbolic name “Football is the ambassador of peace” took place in Tiraspol, Kishinev and Kongaz. USA and Great Britain embassies in Moldova, and also the Federation of Football of Moldova, under support of the Ministry of Internal Affairs were organizers of this youthful football festival. 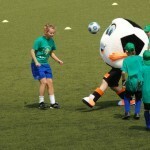 In this grandiose football forum 384 young football players from 14 football clubs took part. The “Sheriff” sports complex held the festival in Tiraspol. Young players from FC “Sheriff” (Tiraspol), FC “Dynamo” (Bender), FC “Buyukan” (Kishinev), SSSR (Kishinev), also women football teams of sports child’s and youthful school of the Olympic reserve N4 (Tiraspol) and FC “Dynamo” (Bender) demonstrated their skills on the covered arena of the “Sheriff” sports complex. In frameworks of the festival “The child’s rights code” was signed by its visitors. The Code was signed by Shennon Kit (the ambassador of Great Britain in Moldova), Nikolai Chebotar (the general secretary of the Federation of Football of Moldova), Viorel Gaina (the MAI representative), Yana Pogarevich (the OFFS instructor) and young players Nikita Lukyanov (FC “Sheriff”) and Artem Kulibaba (FC “Buyukan”). Twelve formed on the tournaments teams wrestled for the main prize “The Peace Cup”. Best four players of the football festival were awarded by “ORANGE”. According to tournaments resumes they were: Alia Pestova (sports child’s and youthful school of the Olympic reserve N4, Tiraspol), Maksim Bradsburg (FC “Sheriff”), Mircha Modirka (FC “Buyukan”) and Kristina Bachu (FC “Dynamo”). The football holiday ended with friendly match between united team of USA and Great Britain embassies in Moldova and the Federation of Football of Moldova team on the FC “Buyukan” stadium on Sunday, July, 12th.